Joining Greek Life is the perfect way to get involved in campus while you are studying hard for your college diploma. 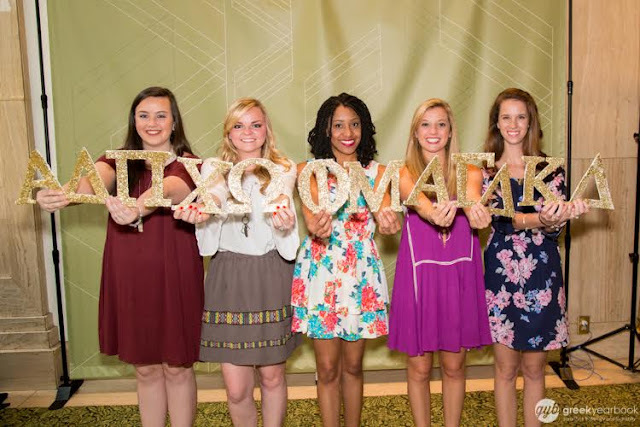 Joining a sorority is a lifelong commitment that will extend beyond your undergraduate career. If you are considering rushing this fall or if you’re decorating your graduation cap, being a member of Greek Life will definitely help you avoid some of those #postgradprobs! Here are 3 ways Greek Life prepares you for life after college! Joining a nationally recognized organization opens the door to thousands of networking capabilities! You will be able to attend National Conventions, an event that brings together sorority sisters across the country. Not only will you establish life lasting friendships, but you will be able to connect professionally with someone in virtually EVERY career field. Many sisters are more than willing to help you grow professionally and could even help you score your dream job! If you have the opportunity to take on a position, DO IT! Council positions are a great way to get involved within your sorority and help boost your resume at the same time! Taking on responsibility will help you as you transition to a full time career. Understanding delegation, management and organization will be extremely helpful. These positions are also a great way to show off your many skill sets in interviews! For example, if you were in charge of planning bid day, you can talk about the coordination of bid day photographers, management of bid day activities or how you created the perfect bid day theme! All of these accomplishments matter and can help you perform well in future job interviews! Juggling the tremendous amount of meetings, philanthropy events, classes and a social life will make you a pro at time management! Learning to prioritize is super important in the real world. Understanding how to get every task done in an 8 hour work day can be stressful, but if you come in with great time management skills it should be no problem! Getting things done on time will not only please your boss, but it will help you climb the career ladder faster! Most importantly, good luck to all our new grads on your transition to adulting! I wasn't in a sorority when I was in college, but it sounds like you learned a lot of great lessons! Totally agree with all of these! Greek life is a fantastic networking tool. Such a good point! I can already tell Greek Life has made such an impact on my future. Great post! I wasn't in a sorority in college, but it sounds like you had an amazing experience and learned a lot! Though I don't think Greek life is much like the real world I do think there are valuable skills you can develop in the Greek system. Aside from the leadership skills I developed as an officer in my house, I think learning to live and cope with so many different people on a day to day basis is super valuable! Great points! I would have never thought about the networking aspects of Greek life but those are definitely valuable real world skills! I never rushed because the greek life was never appealing to me. However, I can see why so many people love it. I agree that networking is a huge plus! You make some good points-- part of me wishes I had rushed back in college and been more involved with the school and met more people. Yes yes yes!! I was a Vice President in my sorority and I couldn't agree more. It gets a bad wrap, but it totally shouldn't! I love my sorority! It was the best decision I ever made in college! Sounds like you learned a lot from your experience there! My teeny tiny school doesn't have Greek life, so I won't ever be in a sorority... But I know lots of girls who are in sororities and have had great experiences! It sounds like it can really help you learn a lot and form some lifelong friendships! My college didn't have a good Greek life and I wish I could have participated. Sounds like a great experience!